First of all readers, an apology. My university career has been a stress-filled and busy place of late, but I can happily report that I have come through unscathed and now near the finish line for three years of hard work. All this however, has caused some neglect to my writings and for that I am sorry. But never fear friends because I have returned and to mark this moderately notable occasion I’ve decided to start a series of sorts entitled “Lyrics of the week”. Catchy, eh? Something I’ve always wanted to do is bring back lyrics to their rightful place and to have them considered in the same league and under the same ‘rules’ as music. All to often they’re ignored as a vehicle for a vocal melody and good lyrics are easily missed in bad songs (see Born In The USA) and poor ones missed in great songs (see Hey Jude). They are after all, the poetry of music. So I’m going to attempt to write a little bit of that wrong. Each week, I’ll pick a verse, chorus or just phrase from a song that I like or you might’ve missed and herald it’s virtues. There’ll be no philosophising and no great essays, just me appreciating some brilliant and beautiful words. You’ve probably noticed the first one directly above this post and it’s a cracker to start (Simon & Garfunkel’s The Sound of Silence to be precise). Also, keep your eyes peeled for some new reviews on the way soon. I’ve a few promo CDs and plenty of MP3s waiting to be dissected, including the forthcoming album from Exit Calm (myspace.com/exitcalm) and also Mainly Genius idol Paul Weller might sneak his latest offering in these hallowed, virtual pages. 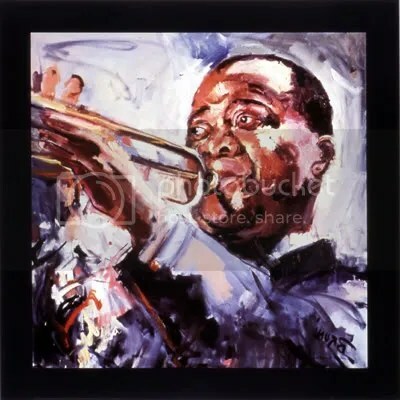 So watch out for that and until then enjoy Louis Armstrong (because I’ve just bought a CD of his and it’s fantastic! ).